KOKOMO, Ind. – It had the makings to be one of his most enjoyable seasons coaching baseball in a sparkling new stadium. 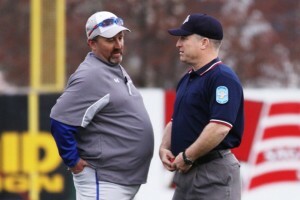 Instead, Tim Weeks learned he would not return for a fifth season as the head coach of the Kokomo Wildkats. Weeks will not be at the helm of the Kats when they play in the inaugural game at Kokomo Municipal Stadium next spring after being told his coaching contract would not be renewed. The Northwestern High School graduate had a 46-62 (24-30 in the NCC) record in four seasons as the Wildkats skipper. He was coming off his best showing in the North Central Conference at 6-6, good for third place. But Kokomo did not win a sectional title during his time running the program after the Kats won two in the previous four seasons. In the Kokomo School Corporation’s only statement, Director of Communications David Barnes said Week’s contract was not renewed, “at the recommendation of the athletic director.” Weeks said he was disappointed and does not agree with the corporation’s decision. He also contends he did nothing wrong. Weeks was an assistant coach for the Kats when he took over a highly successful Kokomo program following Steve Edwards resignation (Edwards is now principal at Frankfort High School). In Edwards six seasons, the Kats were 133-45 with a pair of sectional titles and a trip to the 2007 IHSAA Class 4A state title game. With head coaching experience in high school football, Weeks – who endured an injury-plagued season in 2013 and a young squad in 2014 – said he understands the inherit challenges of coaching at the prep level. Despite the school’s not renewing his contract, he had a message for his supporters. Weeks also talked about his faith, which he relies on during difficult times. The former Wildkat baseball coach said he wants to see the Kokomo program flourish in the future. Kokomo will start the search for a new baseball coach immediately. This entry was posted in Baseball, Kokomo. Bookmark the permalink.